In today’s fast paced and mobile world often our customers, vendors and collaborators expect 24-hour availability and instant responsiveness. Business people are expected to be able to respond to situations with the smallest possible turn around times. The growing popularity of smartphones gives even more weight to these expectations. The advent of light, powerful laptops in the early 90s led to a mobile revolution. It freed workers from their offices and allowed them to work remotely and while on the go. The advent of powerful smart phones has allowed us to take the tele-work revolution one step further. Workers have now been freed from the need to be close to networks, power sources and peripherals. Most smart phones can edit documents, surf the Internet and send email. These cornerstones of business communications are further extended by the ability of these phones to download additional applications. In addition to these basic functions, a smart phone will also allow you to IM, Skype, SMS, MMS, Tweet, Blog, Phlog, Vlog and use a host of other business and social networking features. If you are not a smart phone user, placing all of these features in the palm of your hand may seem daunting. Once upon a time there were few true smart phones to choose from and they were mainly used by high powered executives and the technorati. Today these phones are becoming more and more popular, the cost to buy and use them are drastically lower than when they first came to market. All of the major service providers now offer access to high-speed data networks. One of the main barriers to adoption for many people is the perceived need to learn new technology. Many users are unwilling to invest the time or put up with the aggravation of learning to efficiently use a new mobile device. In 1996 when the first Palm OS was introduced, it took users a while to learn the intricacies of the Graffiti language. 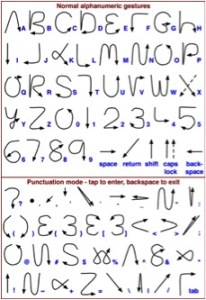 Once they did however users found a wonderful and powerful handwriting recognition tool. One of the reasons that the Grafitti language was easy to learn was that Grafitti was based on a set of standardized gestures. This system was effective because the gestures for the letters and numbers were based on the characters that they represent and the gestures for actions and punctuation were simple and intuitive. Building upon learning that users have already had is a very effective way of minimizing the amount of effort users have to put into learning a new system. Many smartphone makers have taken a page out of the Palm OS book. One of the things that the iPhone does well is take advantage of the iconography used in the Apple OS. iPhone users don’t have to learn what icons mean. 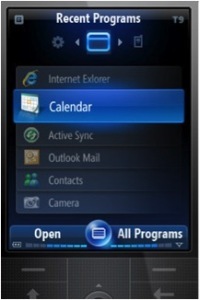 One of the most hotly anticipated smartphone operating systems of the year has been Windows Mobile 7. It too takes advantage of the knowledge that users have acquired while using the Windows 7(TM) operating system. Screen layout, icons, terminology and information architecture will all seem familiar to those who use the Microsoft Windows operating systems. These similarities are carefully thought out and planned in order to maximize the learnability and the usability of these smart phones. As a small businessperson looking to maximize productivity and stay connected concern over having to learn a new bit of technology shouldn’t be a barrier to switching to a smartphone. No matter what type of computer system you’re used to, there is a smartphone out there that will allow you to use your existing knowledge to get up and running with minimal new learning.